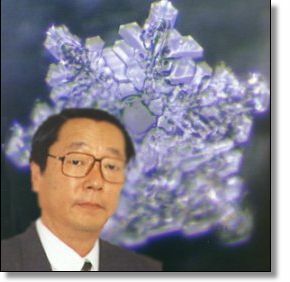 Dr. Emoto and a beautiful water crystal. What the bleep do we know about the power of our thoughts and words? I had fun with my previous post, “Up 2 the ‘C’ in Focus,” and then I remembered enjoying the movie, “What the Bleep?” In this short clip from the movie, the amazing work of Dr. Masaru Emoto is featured. I find his research on the effects of words, thoughts, meditations and prayers on water to be extremely thought provoking. Of course, the obvious connection here is the fact that our human bodies are- to a large degree-comprised of water. I’ve seen a lot of debate over exactly what percentage so I won’t go there here. A few years ago, my then four-year-old daughter had a destructive streak going and she enjoyed breaking everything she could get her hands on. As I gathered up all the mini Disney Princess Christmas ornaments, I found- with growing frustration-that they were all missing body parts. What the bleep??!! Tinkerbell with no wings! Snow White without a head! Belle with no feet! Me with no patience for this!!! I found myself at eye-level with her (mmm, that really makes those negative comments sink in fast and hard) saying, “I can’t have anything nice! You break all my pretty ornaments!” And as I heard the words spew out of my muzzle I realized I was “affirming” this negative trait in her. Labelling her for history. So, within the next couple of days, I changed my tone, my mind, my story and eye-leveled with her, saying, “You treat all our nice things so gently…blah, blah, blah.” I know, it feels silly at first but the transformation was so worth it!